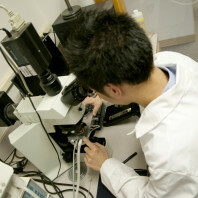 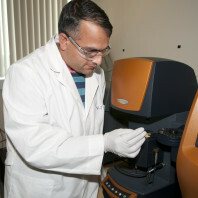 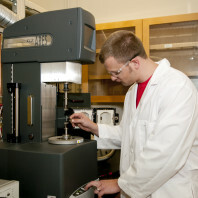 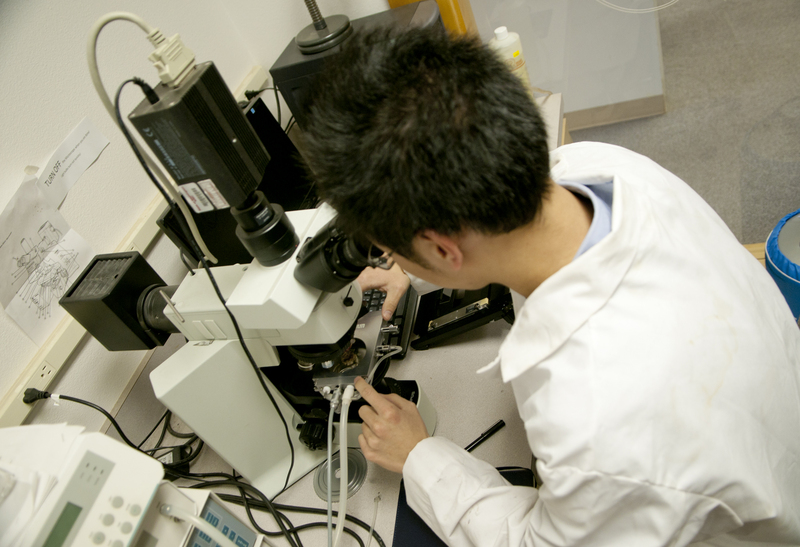 The Polymer Composites Research Group’s labs are located in ETRL 322 and ETRL 326. 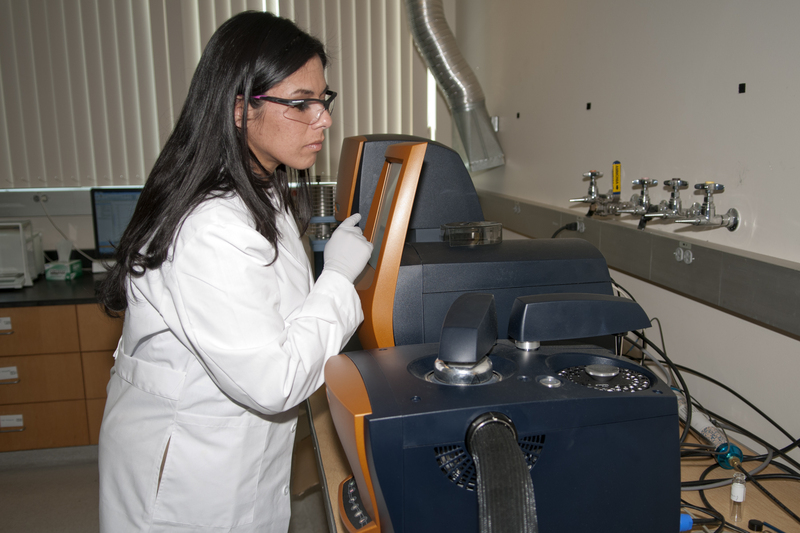 This laboratory space includes two large fume hoods, ample bench space, and state-of-the-art equipment for characterizing and synthesizing polymers and composite materials. 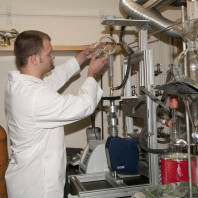 Click on the thumbnails below for the larger image. 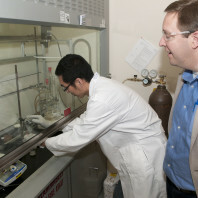 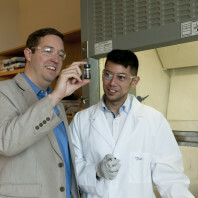 Dr. Bingtao Wang performs polymer synthesis in a fume hood while Prof. Kessler looks on. 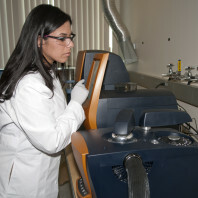 Kathryn Mireles runs an experiment on the differential scanning calorimeter (Discovery DSC, TA Instruments). 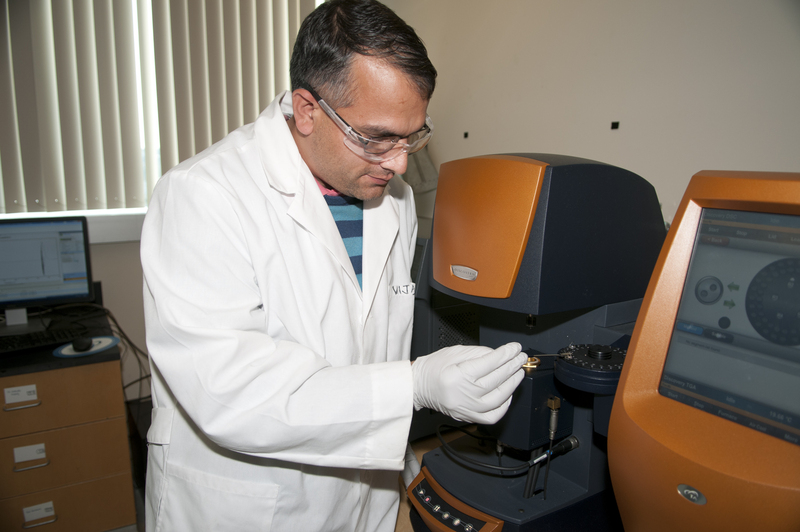 Dr. Vijay Kumar uses the thermogravimetric analyzer (Discovery TGA, TA Instruments) to measure weight loss vs. temperature for a polymer sample. 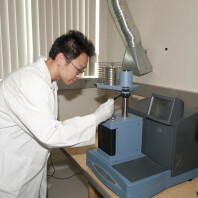 Dr. Yuzhan Li uses the thermomechanical analyzer (TMA Q400, TA Instruments) to measure the coefficient of thermal expansion of a composite materials. 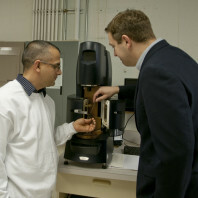 The ARES-G2 (TA Instruments) is a rotational rheometer for advanced research and materials development. 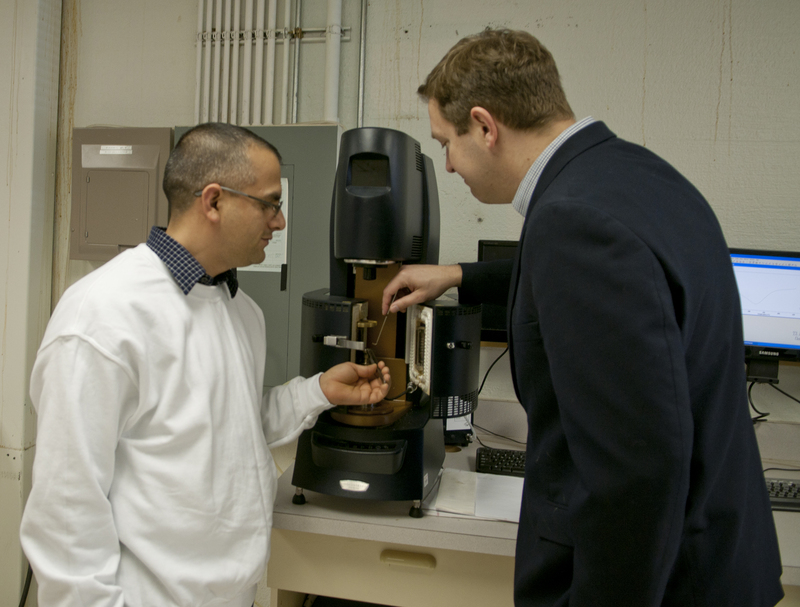 Accessories for the rheometer include advanced peltier system (APS), forced convection oven, dynamic mechanical analysis, UV curing, dielectric analysis, extensional viscosity fixtures, and a variety of measurement geometries. 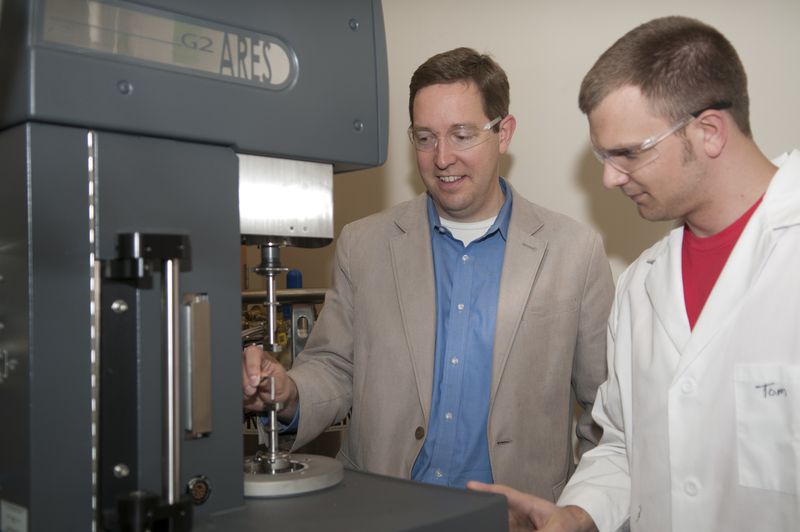 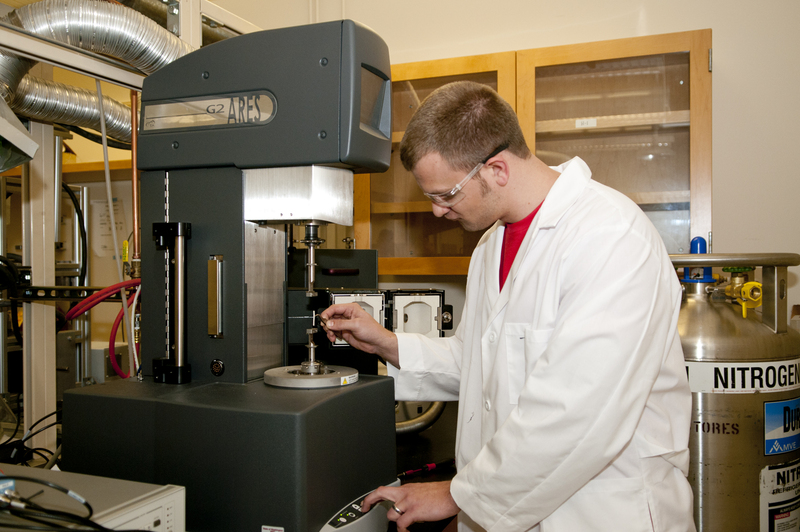 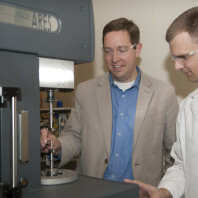 PhD student, Mitch Rock, explores the viscoelastic material properties of a polymer sample with the ARES G2. 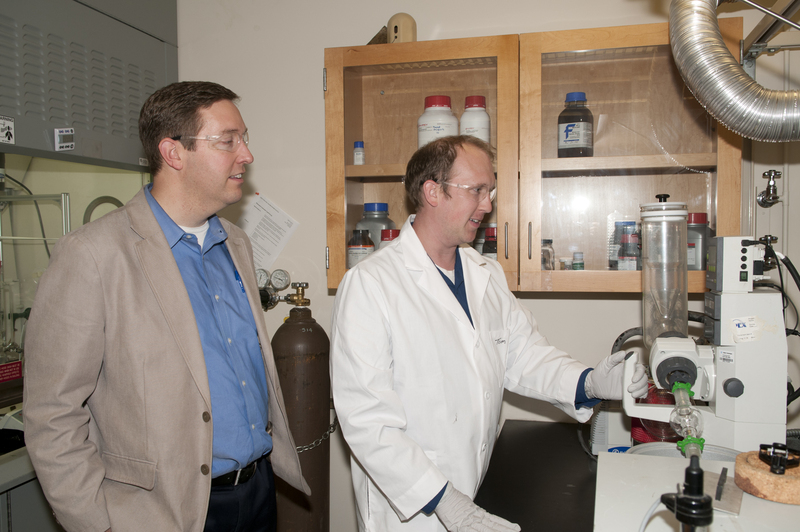 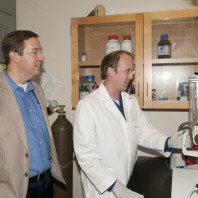 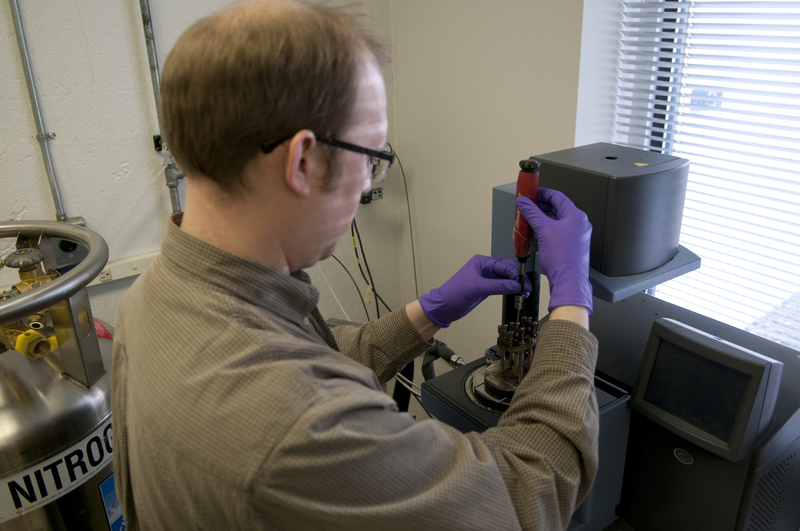 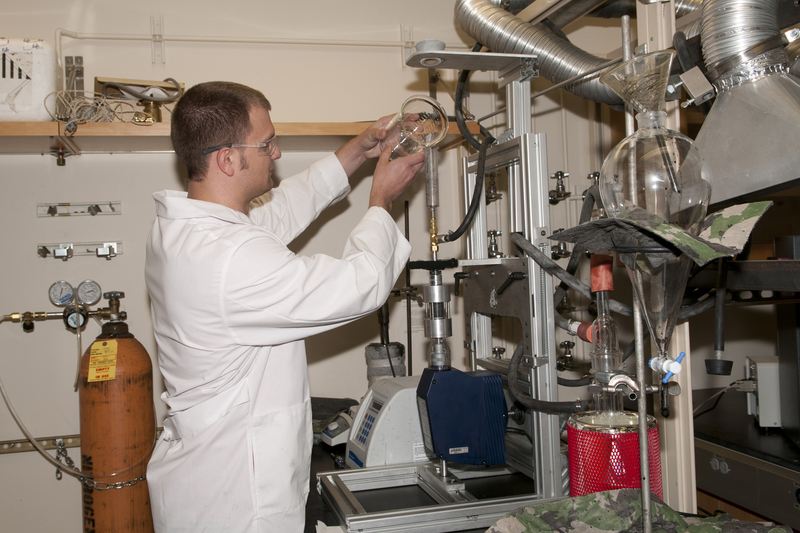 Dr. Tom Garrison uses the rotary evaporator with vacuum controller to remove solvents from polymer samples. 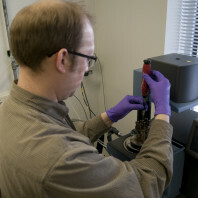 Mitch Rock adds solvent to his custom built nanotube shear alignment apparatus for synthesizing aligned Buckypaper sheets. 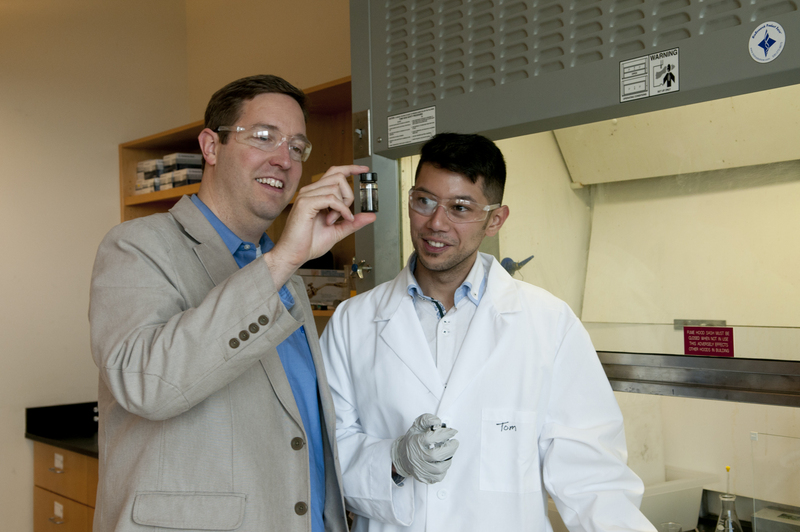 Undergraduate research assistant, Charles Carver, and Prof. Kessler examine a dispersion of functionalized graphene in a solvent. 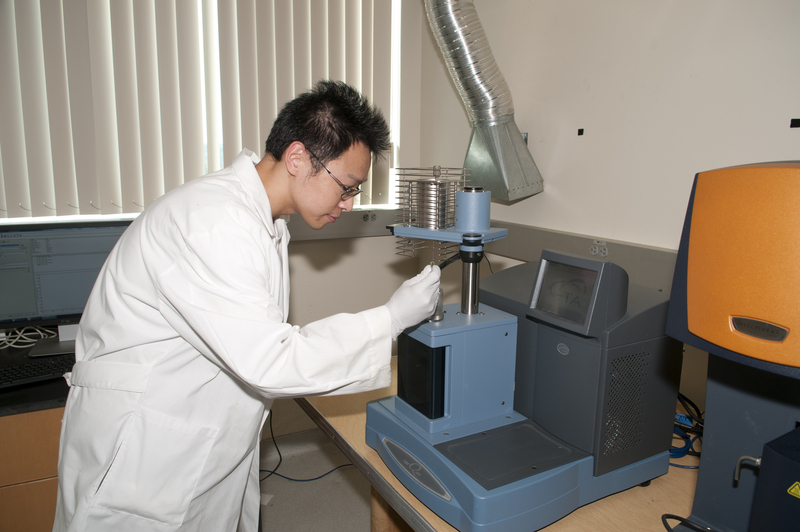 Dr. Yuzhan Li in the CMEC lab using a polarized optical microscope and heat stage to observe liquid crystalline epoxy resins. Research group in the lab, Spring 2015. 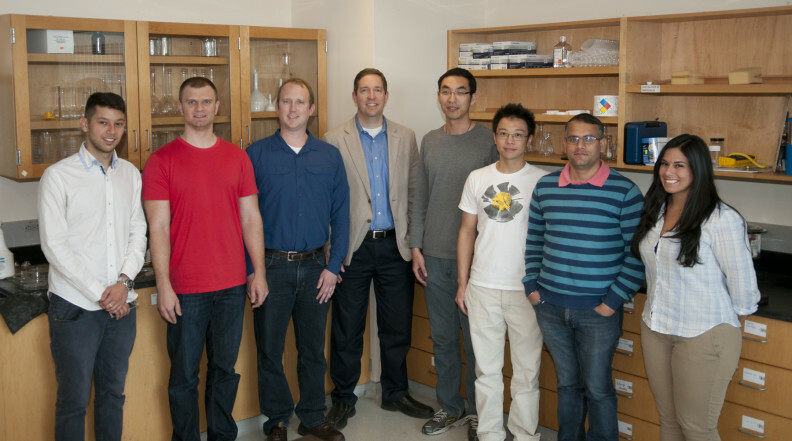 From left to right: Charles Carver, Mitch Rock, Dr. Tom Garrison, Prof. Michael Kessler, Dr. Bingtao Wang, Dr. Yuzhan Li, Dr. Vijay Kumar, Kathryn Mireles.